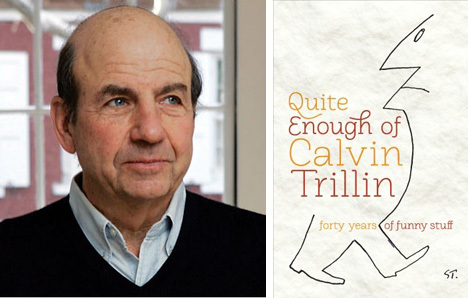 Calvin Trillin is a national treasure, but one not known by enough readers. His lovely ode to his wife and muse Alice, About Alice, made a bit of a splash a few years ago, but for many readers Trillin still isn’t a household name because much of his best work was in the form of columns and short journalism pieces, many of which were published in The New Yorker. Trillin is a homespun, peevish, wonderfully droll American humorist. He perhaps first made a name by writing about the foods that made America great, not high cuisine but regional dishes like ribs, cajun food, deep dish pizza, and chili. This writing is collected in The Tummy Trilogy, which I also highly recommend. But over the years, Trillin has tried his hand at all kinds of writing, a novel that is mostly about parking in New York City, impish little poems that skewer our political process, short articles about the writing life, tales of the put-upon family man, a memoir of his father, and so on. To get a sample of all this variety, the easy place to start is with his 2011 collection Quite Enough of Calvin Trillin. It has selections from forty years of his work. My advice for those trying to get started with one of our best living humorists is to sample here, then pursue more of the kind of pieces that you like best. Calvin ‘Bud’ Trillin will make you hungry, tearful and giggly, and you will love every minute of it. From “Alice, Let’s Eat” to “About Alice”, or just talking about the value of bagels and a parking spot, Trillin makes life pop. Thanks for introducing him to more folks! I quite like Trillin and should put him on my blog. Thanks for highlighting him here!